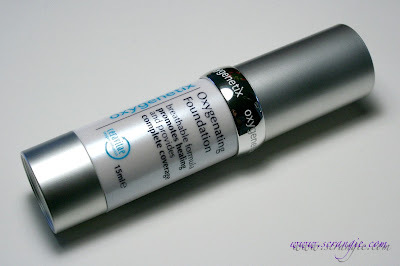 "Oxygenetix Breathable Foundation is a breakthrough foundation to cover, help heal and minimize - even eliminate - procedural scars. Designed for doctors, Breathable foundation covers and treats a wide variety of skin problems: skin injuries, wounds, rashes, cracked, dry skin, acne scars, rosacea and other skin conditions. On post-surgical scars, patients are re-assured and impressed that after care includes safely camouflaging any evidence of surgery. "Ceravitae", the super charged oxygen complex in Breathable foundation, proliferates collagen cell and connective tissue growth in aging or wounded skin. . Because of the unique properties of Oxygenetix, it is also great skin care that can be used as a daily skin friendly foundation." Lots of foundations claim to improve your skin while wearing it (Bare Minerals, Neutrogena Healthy Skin and various brands of BB Cream come to mind), but this one actually says that it can eliminate scars, protect and heal wounds, and has full coverage. I haven't had any surgery and I don't have any injuries or wounds on my face that need healing, but I do have dry skin sometimes and plenty of dark/uneven spots that I want to cover without caking on a heavy-duty foundation. 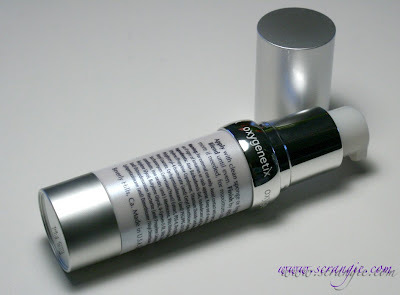 Oxygenetix foundation comes in a silver and white tube with a pump. It's the type of pump that doesn't have a stem that goes into the bottle, it's the type that relies on suction/pressure to dispense the product (like the Skyn Iceland bottles have). The shade names are printed on the bottoms of the bottles. There's no other indicator of the shade on the bottle. The bottle contains 15ml (0.5 oz) of product and the ingredients are printed on the back of the tube. Just a few notes about my skin type and how I used this product before I go into my likes/dislikes: I always apply my foundation on moisturized skin using a damp Beauty Blender sponge. 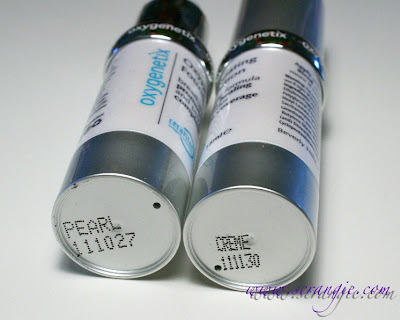 My skin is not oily or very dry, but I do get dry patches fairly frequently. My skin isn't particularly sensitive, but I do tend to break out from certain ingredients (namely mineral oil, salicylic acid, and sunscreen) and my main concerns are uneven skin color (dark patches, red spots, and freckles) and mild hormonal acne. 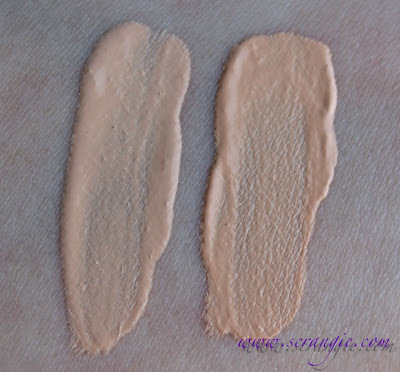 The foundation does feel very gentle and soothing on the skin. It's not drying or heavy, it's not irritating, it doesn't sting or burn. The foundation has a nice consistency- it feels like a mix between a thick lotion and a gel and feels slightly cool or wet when applied. It doesn't look heavy or cakey and it doesn't settle into my pores. It feels more hydrating than other foundations I've used. It wears fairly well (at least 8 hours) and doesn't seem to oxidize on me by the end of the day. It does get pretty shiny, though. Despite the claims that it can cover scars and imperfections, I found it to be too sheer. It is definitely not a full-coverage foundation like I thought it would be. You can't tell the color of the product without using it (because of the opaque bottle) and it's hard to choose the correct shade from the color chart. 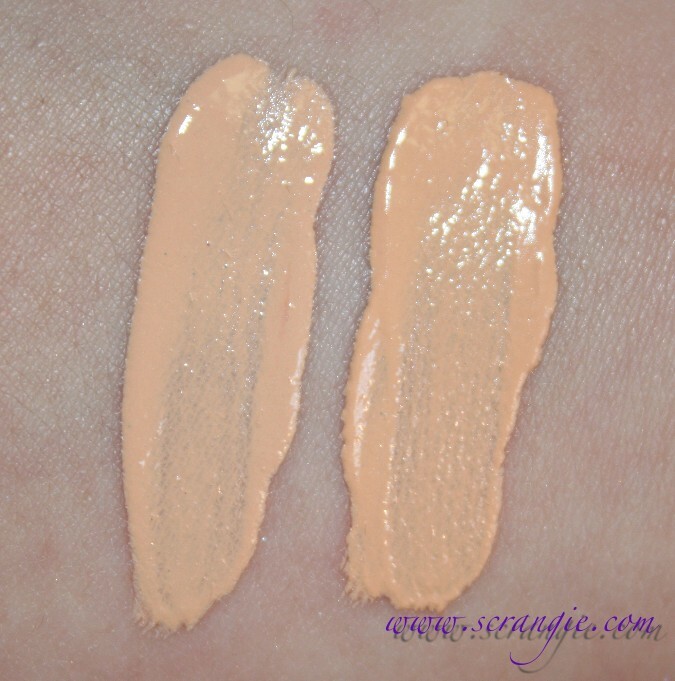 I have to use more of this product (two to three full pumps) to achieve the level of coverage my usual foundation gives me with half the amount. It feels a little sticky on my face and has more of a dewy finish than I usually like. When applied with my fingers, it accentuated the dry areas of my face. It applies much more evenly with my usual damp Beauty Blender dabbing method. There's a surprisingly tiny amount of product in the tube (half an ounce), especially for the price (MSRP $70). The condition of my skin didn't change or improve while using it. It's hard to obtain because it's only sold at certain spas, doctor's offices, plastic surgery centers or a few places online. Overall, I thought this was good but not life-changing. I was disappointed by the lack of coverage it provided, but that was the only major flaw for me. I don't have a whole lot to cover besides freckles and red spots, but I was surprised at just how little coverage it gave me. I had to use a lot more of this than I thought I would, and with such a small bottle, I would probably end up finishing this within a month or two. And for the price they charge, it's not something that I could afford to use on a regular basis. They should at least give you more product for the money. It wasn't a bad product. Not at all. It looked decent on my skin and didn't cause any problems, but it wasn't miraculous or all that different from any other foundation I've used. I can see how it would be therapeutic for people with easily irritated skin, and it does seem gentle enough to use over fresh scars or recently treated skin, but unless I was having plastic surgery, I personally wouldn't pay the $70 for this. You can find out where to buy Oxygenetix near you by using their retailer locator. I've only seen it for sale at one place online, but I've never ordered from there so I can't vouch for its reliability. I'm wondering if their trying to a tinted version of La Roche's Cicaplast? Hmm... I'm not familiar with that product, but I'm going to go check it out online and see if they sound similar! Great review! This does seem really expensive, especially if you have to use a lot of product. Thank you! I nearly choked when I saw the $70 MSRP. It's good, but it's not really $70 good. Yikes! Comes off that way to me, too... Those are some pretty big claims it makes!